Through the bars I see Anne Murray parked in the dark confines of a storage room. She has a brace tied to her wheel and a tag wrapped around neck. A series of events that could only happen in rural Africa have left Anne imprisoned. Only a case of bad luck could have me on the 1500h train to Franceville without her. The sliding doors to the navy blue train pop open and a handful of people step off into the heat of Gabonese afternoon sun. I take their place inside the crisp air-conditioned train car and lug my backpack to my seat: number 65. A man in a dramatic blue vest stands on the steps of the car with a bullhorn and calls his warning that the doors will soon close, and they do. Dust covers my window, but I force my gaze through at the town of Lope and its desolate state. Clouds hang like cotton swaps over the submarine yellow train station, and a group of children chase an inflated tire around potholes on the street alongside. Lope has been a disaster, but in terms of content, it’s an absolute goldmine. A couple days before I had the pleasure of arguing with a dodgy tour company over paying for a tour we never booked. That night, I drained my worries away in a couple 700ml bottles of Beaufort beer. Hazy from a long day trekking in the jungle, waiting in the heat of the savannah, arguing in a parking lot, and of course the beer, I walked across the washboard highway to the general store which also doubled as the only gas station for 150km in any direction. 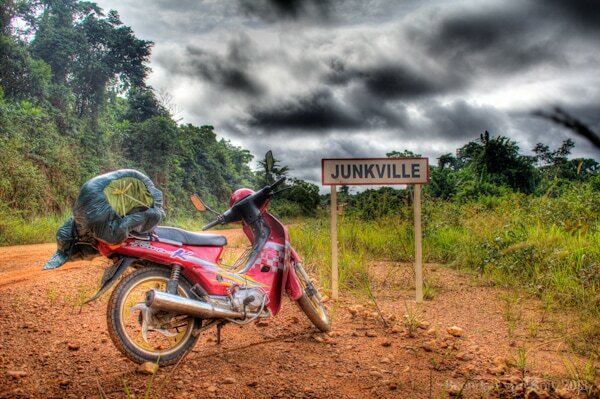 No fuel, no traffic, and serious jungle… a deadly combination. “C’est fini.” The shop keeper said while not losing sight of the other drunk patrons who knock back bottles of 33 Export, Castle beer, or glasses of pastis. “Tomor…” The owner cut me off before the word could even be spilled from my worried lips. I turned and walked out the open doors of the shop and onto the dusty streets. Lopes feels a lot like one of those old wild west towns. A water town stands proudly on a hill over town announcing the city’s name, dogs chase one and other then team up to bark at the occasional car, and there is a desperately lazy mood that always seems to hang so casually. My table at the wood planked hotel/bar where I stayed in Lope was occupied by a truck driver from Chad currently drunk off of a mason jar full of pastis. He mumbled his words, but those that did come out were as intelligent as any sober thoughts. So as the train pulls smoothly from the station in Lope a couple days later, I leave and Anne Murray stays behind. I don’t feel right leaving without her, but she will catch up in a couple days once she is put on the merchandise train. Although I don’t like leaving her behind, I have no choice. My visa for Congo expires in just 9 days and I haven’t even entered the country. 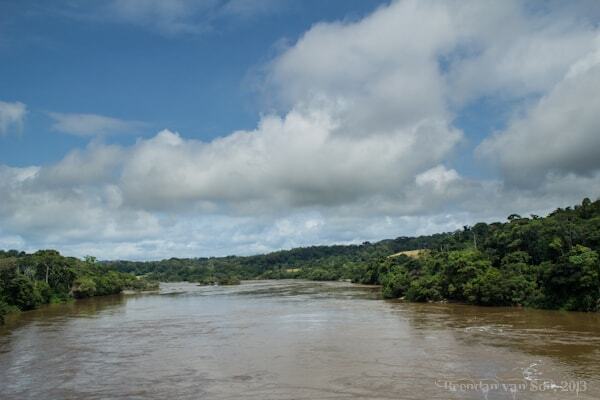 If Anne arrives in time, I’ll have about 4 days to cross what’s left of the Gabonese jungle, drive through 100km of a track of sand famous among overlanders, cruise nearly half of the country’s highways, and then find a boat to the DRC. I can’t help but be nervous, but I have no choice. Inside the train, there is a calm unlike I’ve felt in Africa thus far. Everything is so organized. The seats are all clean, the luggage all stowed away neatly, and the patrons all occupying their assigned seats. Men in floral print dress shirts and shiny black shoes read the local papers with crossed legs, women in Hillary Clinton pant suits gossip quietly, and children play games on iPads and Samsung tablets. I can’t help but be struck by the juxtaposition of the 1500h train to Franceville and the world outside my window. Out there, a wild forest canopy drapes over the land like a poorly stitched blanket. Timid ebony trees poke through and the occasional stream carves a seem through the foliage. We crisscross chocolate milk rivers which swell well into the shoreline. I can almost see a line of elephants crossing the river, a group of hippos poking their heads above the surface, and a displaying silverback gorilla swinging through the trees on the shore. It doesn’t take much time on the 1500h train to Franceville to be reminded why I rarely travel in developed countries, let alone in luxury. Everything on the train is so predictable. The train stops and starts when it should. The passengers follow the rules clearly marked on posters attached to the walls. Everyone is so careful not to disturb anyone. Even the temperature is controlled. I can’t help but be reminded of the bus ride I took in Sierra Leone where the passengers sang, clapped and danced the entire 2 hours. I am reminded of the last train I took in which I stowed away in Mauritania under the stars. Today, travel seems like a packaged microwave meal. It has all the daily recommended nutritional value, and nothing left to chance. To the complaining chagrin of the passengers, the train is 25 minutes late arriving in Franceville. I stuff myself into a taxi for the first time in what seems like forever, and ask to be taken to a hotel I read about in the Lonely Planet from nearly 10 years ago. The hotel manager tells me there’s no rooms, so he shows me to their second place, which is in the back of a bar which blares a mix Cuban music and High-Life tunes from Ghana. My room’s massive door does nothing to dull the sound. I toss my bag on my thinly mattressed bed and head for the bathroom. I relieve myself into a seat-less toilet whose water bounces with the rhythm of the latest salsa to hit the speakers. I press the flush and as I do a 2-inch long cockroach is twisted into the whirlpool dancing its legs desperately to the beat of the music. 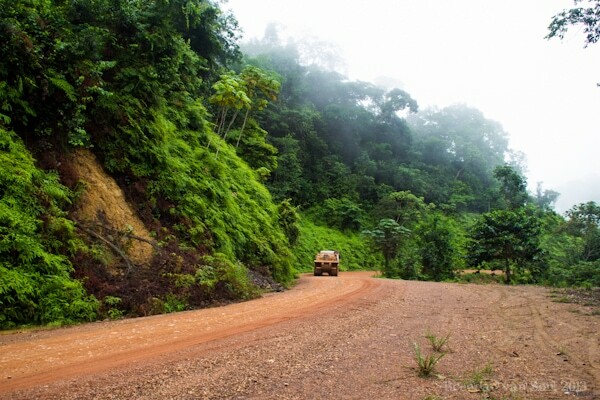 Previous ArticleLope National Park: Bad Business or African Business? An Amazing journey, Brendan! Love this post- so descriptive. Hope Anne Murray makes it through in short order. Ugh, the arrival of Anne Murray… haha. Erik, that is another post for another day haha. Stupid trains. Ugh, the arrival of Anne Murray… haha. Erik, that is another post for another day haha. Stupid trains! Haha, I’m glad other people are finding that stuff funny. When I write like that, I make myself laugh. So I’m glad I’m not the only one. I have been recently following your blog but really fascinating and incredible journey. Do you have a map to show where you are and how Long you have to travel. It is also interesting to see that somehow you have access to Internet but some of these countries are in severe poverty with no infrastructure. Cheema and good luck with your journey. No map yet, but a friend is working on an app right now. Currently I’m in Congo. Internet is everywhere in the world mate. However, it’s really only in the big cities in Africa, and rarely is it fast. Also, I think extreme poverty and no infrastructure is a bit of a stretch. There is certainly some wealth in Africa as is there a decent highway system, train links, ports, etc. etc. Africa isn’t 100 years behind as some believe, there is just a really severe rural to urban divide. Cheers for reading and the comment! Who the hell is Anne Murray? Oh, right. Haha! This was a fun read. That orderly train sounds lovely to me, though. Different folks, different strokes I guess! Haha, Sam! The ability to give Anne a personality has been the true joy of writing this blog for the past couple months haha. Well done, Brendan. Glad you are surviving and thriving down there. Cheers buddy! Hope to see you again on the road some time soon! Sometimes chaos can be beautiful. Few things in the world more beautiful! I agree Matthew.